I first found out about the Male Undergraduate of the Year Award through being a student judge at the TARGETjobs National Graduate Recruitment Awards 2017. As someone who is intending to enter into a career in commercial law, what attracted me to the competition was not only the chance of getting to meet other like-minded and driven students, but also the thought of gaining first-hand experience of how L’Oréal functions within the continually changing fast-moving consumer goods industry. When the applications opened for the 2018 awards, I opted to take the approach of creating a list of the key skills L’Oréal were looking for and then using that list as a checklist for answering the online and assessment centre questions. This ensured that my responses were both succinct and tailored to each question. Fortunately for me, I have previous experience with assessment centres, so I generally know what to expect and what positive traits I need to demonstrate. With that in mind, upon finding out that I had been invited to the assessment centre, I went about brainstorming a list of responses to potential questions that I figured may come up and how I might approach the case study. On the day itself, the people at L’Oréal were incredibly friendly, which helped to put everyone’s minds at ease when completing each task. One piece of advice I would offer to those applying is that for the case study and interview, try to anticipate what your assessor’s questions might be – as this enables you to structure your answers better and means you have a much more confident delivery. In short, believe in what you are telling them, particularly when it comes to talking about yourself. To say that I was elated when I found out that I had made it into the final is an understatement. I knew that irrespective of the result, I had learned so much in both a professional and personal sense. I love Canary Wharf and I enjoy watching 8 Out of 10 Cats Does Countdown, so getting the chance to get a selfie with Rachel Riley at the East Wintergarden was win-win for me. Looking back, despite not being the overall winner, I couldn’t be prouder of making it into the top 10 out of 233 applicants. This may sound cliché but, in my eyes, this competition isn’t so much about winning as it is about showing your potential. 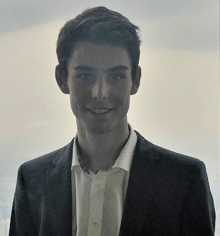 The competition, however, did not stop there for me, as a few weeks later I received a phone call from L’Oréal offering me a ten-week summer internship in their corporate finance team based in Wales. I am pleased to say that I accepted and I now look forward to seeing what I can bring to L’Oréal.